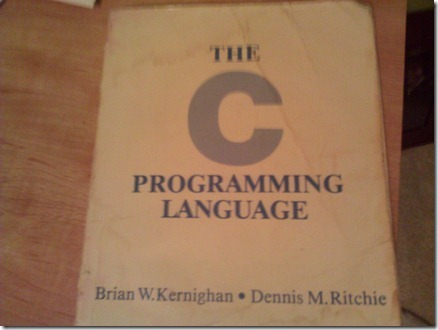 Programmers all over the world will recognize the following book “The C Programming Language”. In fact I hear more people simply refer to it as “Kernighan and Ritchie” and I, like thousands of other developers, had my first introduction to “real” programming concepts and approaches from these very pages. As you can see below this is a fairly old version of the book and was actually “given” to me by an old friend who was attempting to subtly and positively help my career path (my thanks to Phil Robinson). As I was skimming through this book it got me to consider what programming languages I have been exposed to during my life and the subsequent effect they have had on my career. For me it started with BASIC on a ZX Spectrum +2 as a young teenager. I remember trying to hack into the game, Football Director, and I was fascinated by the logic that helped determine whether my team would win or lose, and reviewing the GOTO statements that determined the flow of the game (which was a rabbit warren by the way). Of all the languages, on all the platforms, in all the PCs, I believe the family of C languages remains the most influential. I default to solving complicated problems in a C based language and then mentally convert as desired … I dream in C. Although I took a significant detour during the hey days of Visual Basic very little of the language remains with me at this point, however, a small part of me still dies every time I end a line with a semi-colon . So here, in order, are the languages that constitute my programming lineage, some of these are relegated to the past (BASIC, 8086 Assembler, Turbo Pascal) others continue to evolve in some form or another (C#), and at least one appears to be taking off with the aid of support libraries. What programming languages guided your path?